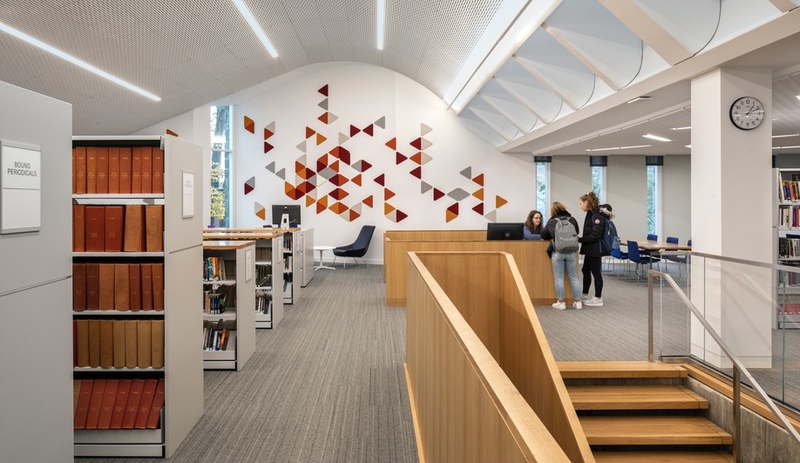 The stately yet whimsical Bergeron Centre, a new building at the Toronto school by ZAS Architects, gets top marks for its distinctive design concept and flexible learning spaces. 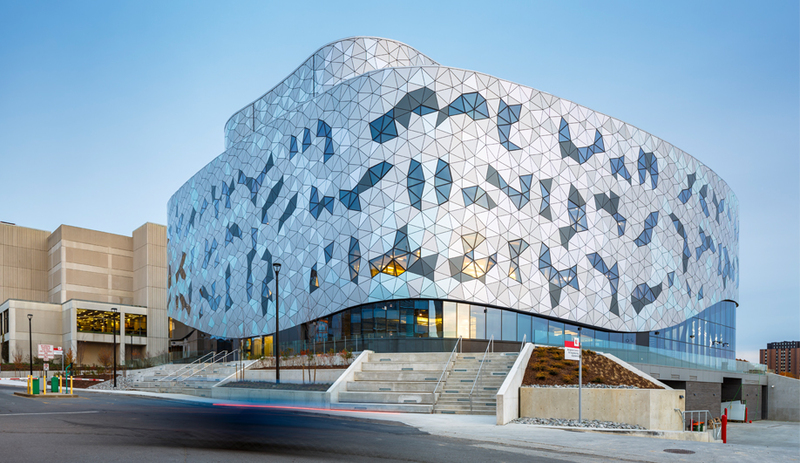 Home to York University’s recently-launched civil, electrical and mechanical engineering programs, the cloud-shaped Bergeron Centre by ZAS Architects is the playful new kid on a suburban Toronto campus block. 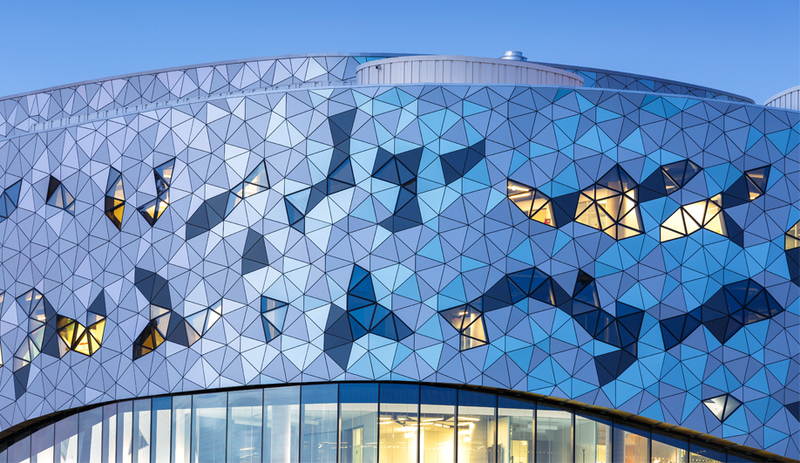 Clad in undulating triangular glass panels laid out by a complex math algorithm, the technical marvel is a far cry from its neighbouring parking lots and Brutalist buildings. ZAS specializes in redefining bland sites with bold architecture. Its edgy River City condo towers, designed in collaboration with Saucier + Perrotte Architectes, transformed an industrial plot of land next to Toronto’s Gardiner Expressway into one of the city’s hottest new communities. The firm’s latest academic project makes a similarly flashy statement for an engineering faculty that’s still building its name recognition. 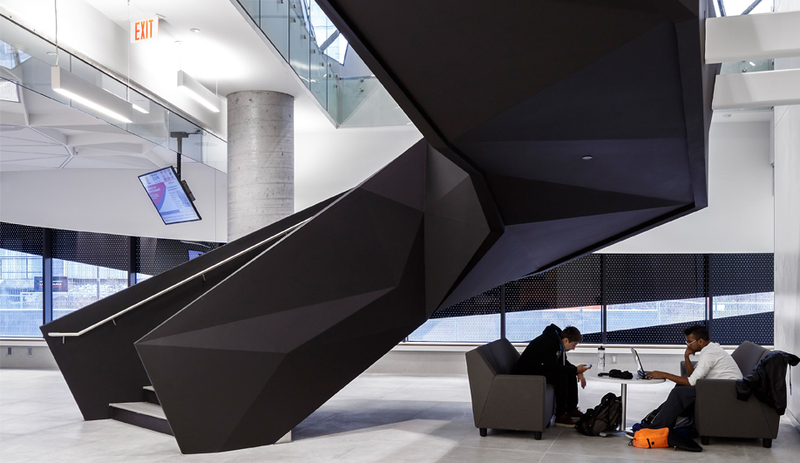 Indeed, Lassonde engineering school dean Janusz Kozinski affectionately refers to his five-year-old institution as a “startup school.” No wonder his forward-thinking department’s fresh 15,700 square-metre digs could pass as a Silicon Valley tech firm’s headquarters. 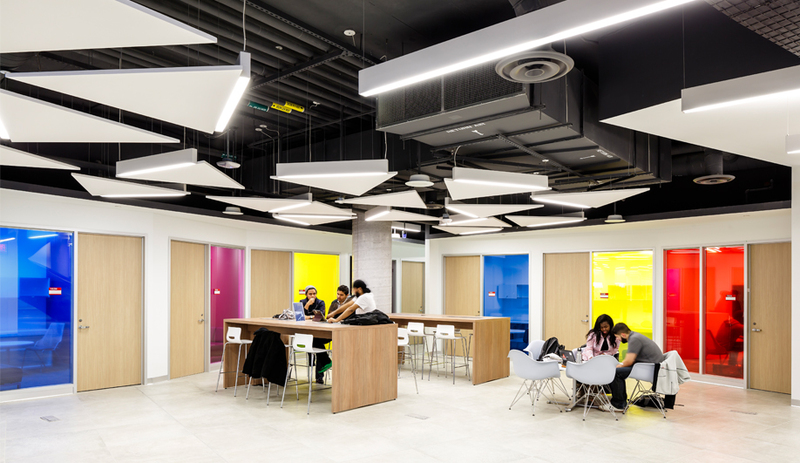 Filled with brightly-coloured sofas and banquettes, the Bergeron Centre’s many open-concept student lounge areas are flexible enough to accommodate both socializing and studying. 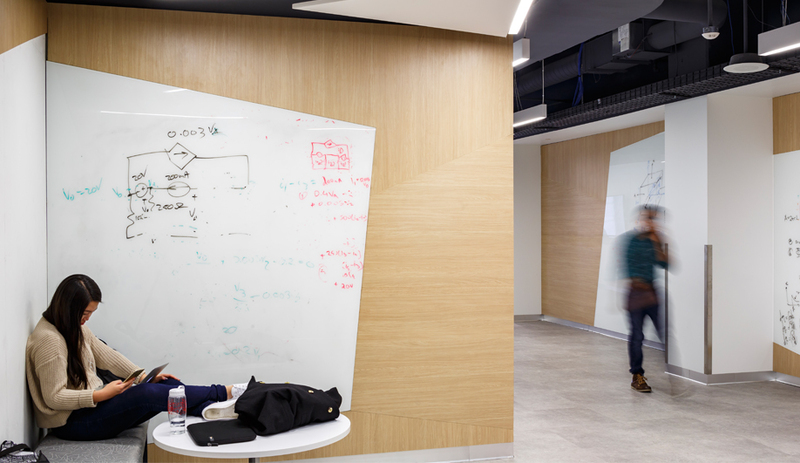 Even the building’s hallways and elevators are ready for impromptu homework discussions; both are covered in whiteboard panels, usually found filled with dense formulas. One thing you won’t find in the five-storey complex: lecture halls. Rather than spending their time on campus in a crowded auditorium, Lassonde students meet in small classrooms to discuss, debate and engage with material they watched beforehand through an online platform. 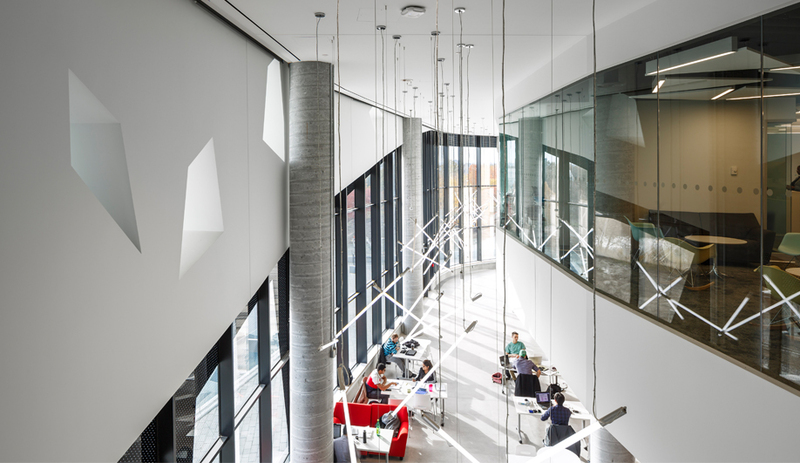 These high-tech learning environments, like the Bergeron Centre’s other student-focused spaces, are located along the periphery of the building and soaked in natural light that pours in through quirky polygonal windows. 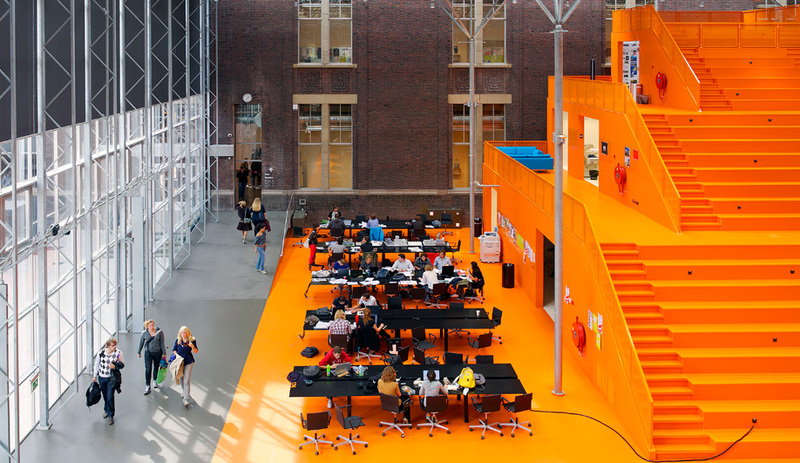 Faculty offices, on the other hand, are cloistered in the centre of the building with no windows – ZAS’s way of encouraging professors to work amongst students. 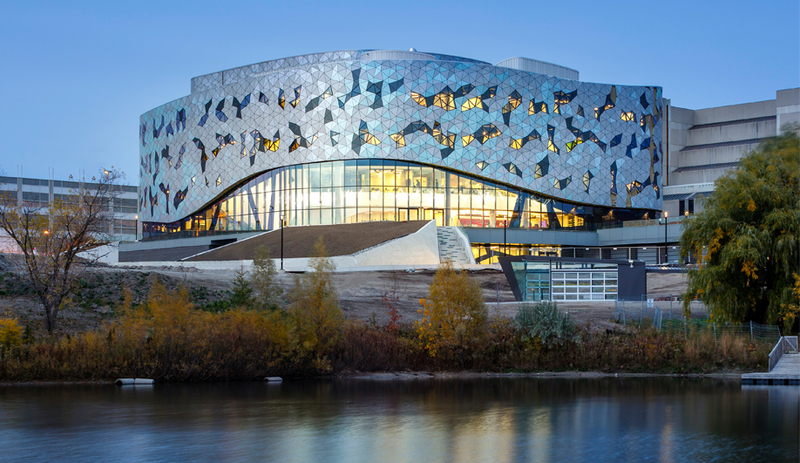 Hands-on learning and deep collaboration are key parts of the Lassonde School’s philosophy; the department aims to raise “Renaissance engineers” who are as scientifically precise as they are entrepreneurial, creative and socially aware. 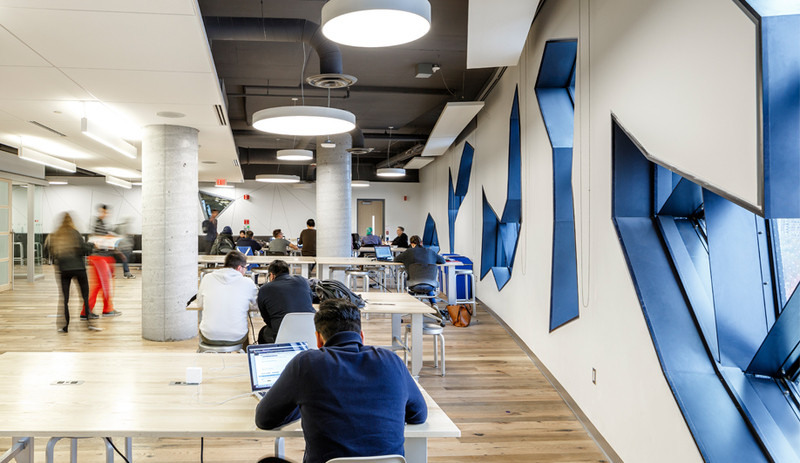 While it does away with many elements found in more traditional engineering school buildings, the Bergeron Centre is still equipped with the specialized workspaces you’d expect in such a facility. 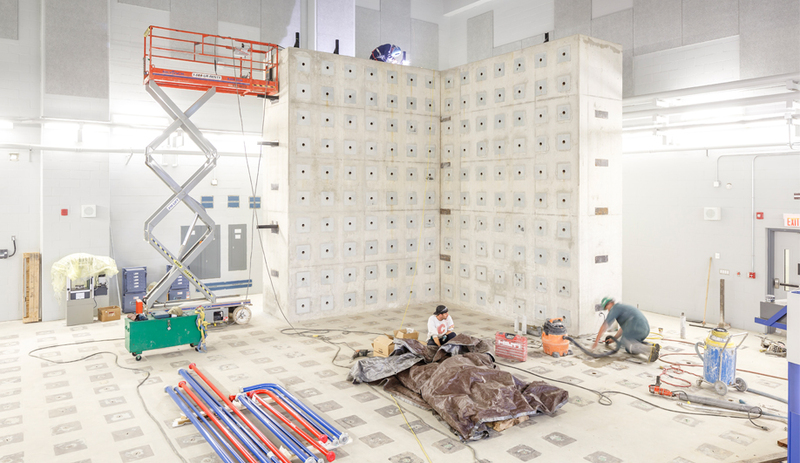 The centre’s most technically impressive room is its high-bay materials lab, which is used for load simulations that push materials like concrete to their breaking points. 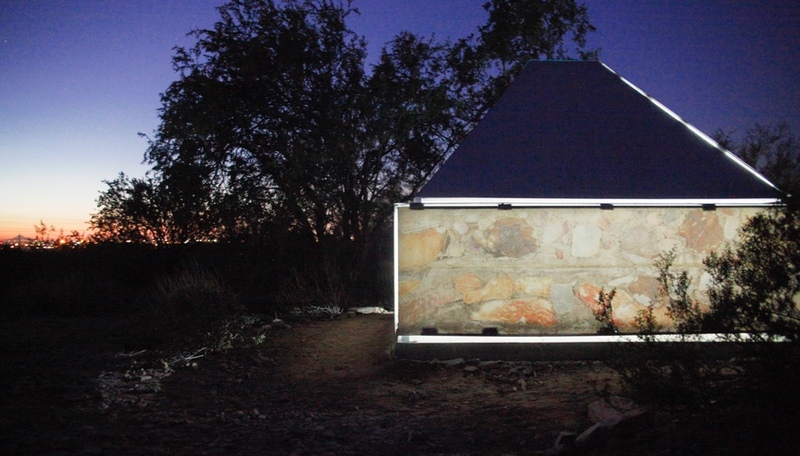 Typically, these environments are built isolated from other buildings because of the noise, dust and vibrations they produce. 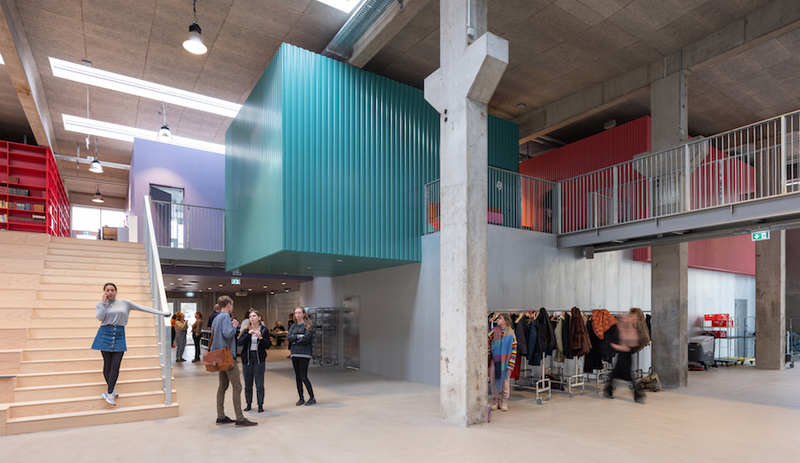 ZAS took a different approach, designing the lab – which includes an overhead crane that can support up to 12.5 tons – as a “building within a building” that rests on a separate foundation and sits enclosed inside a poured concrete cube with metre-thick floors and walls. Other, less intensive mechanical labs located in the building’s lower level are connected by sliding garage doors to a sheltered outdoor courtyard that overlooks a pond and nature conservancy area.